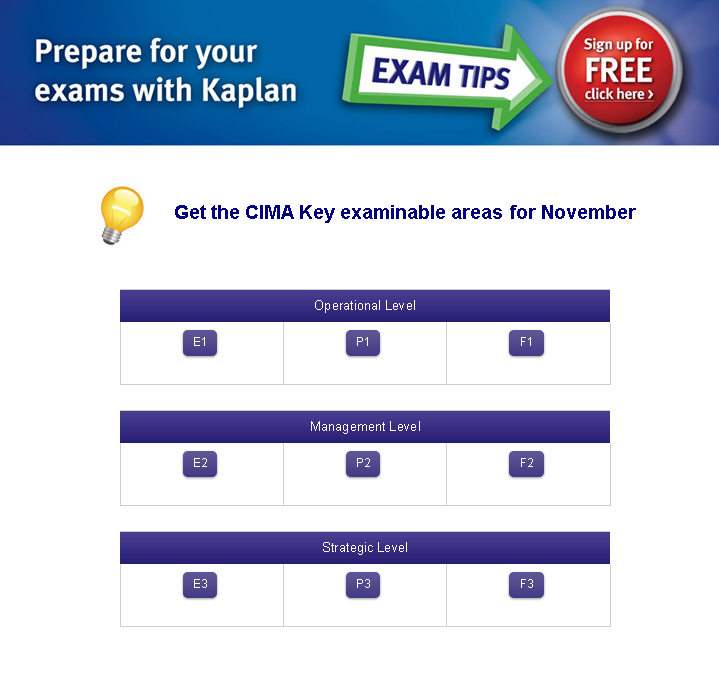 Ahead of CIMA November 2014 exams Kaplan’s view of the key examinable areas for your paper to help with your revision. Practise and hard work have been key to the success of many strategic level students, and it is critical that you get in as many practise mock exams as you can over the course of your preparation. Comprehensive marking with highly detailed feedback is available to give you the critical exam feedback needed to get you through. Please Avoid sharing this Mock exams after buying and also avoid purchase from outsiders or individuals. 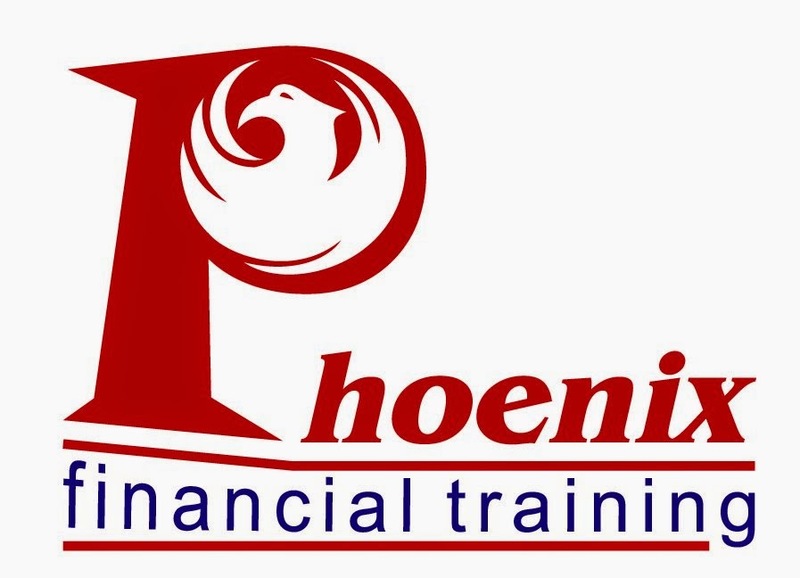 Senior CIMA tutor Vignesh Sivakumar for Phoenix Financial Training provides a detailed debrief of the Strategic pre-seen case for the November 2014 exam. I was recently working with a class around the requirement ‘explain the role and significance of …’ Very few of the class had broken this requirement down into its two constituent parts – the ‘role’ and the ‘significance’. As a result there was a tendency just to discuss the ‘role’ and omit the important discussion of why it was significant, meaning most of those students failed the question. This highlights a key weakness in many people's approach – not creating a structure for their answer. Question planning enables you to create a clear structure for your answer which enables you to clearly break the question down into individual parts, ensuring you attempt each part of the question. Crucially, you must allocate marks to each sub-part of each question using your best judgement, and tailor the length of your answer and the time you take to that mark allocation. Everyone learns 'expertise' as a benefit of outsourcing and all this student is doing is telling us they've learnt that. That's not enough depth to get a mark. A better answer might be something like: ‘the outsourcer is a large company with a huge experience of IT in many industries and a wide range of experts and BBB Ltd would benefit from outsourcing its IT as this will enable them to access that knowledge. 'BBB Ltd currently only has a small team of 4 individuals managing their IT and as a result their internal expertise would be comparatively limited. This additional expertise could produce better systems, increasing productivity and improving information provision across the company. ’Notice then how this answers why they have greater expertise than BBB, and what the true underlying benefit of accessing this expertise is to the business. Aim to write in four or five line paragraphs every time you write something in your answer, adding detail and depth to every point you make. I'll always remember a discussion with a CIMA marker a few years ago; he told me his most frustrating observation as a marker was students who answer the question they want to see rather than the one that is actually there. On a question on the ‘significance of quality’, students will often completely fail to address the word 'significance'. They'll define quality, discuss how to deliver good quality and perhaps outline a couple of quality management techniques, and yet fail to focus on its 'significance'. The problem here is that answering the question in this way scores 0. Do that on a couple of sub-sections of your script and you'll most likely fail. It isn't just an odd few students who make this mistake, it's virtually every script I see. 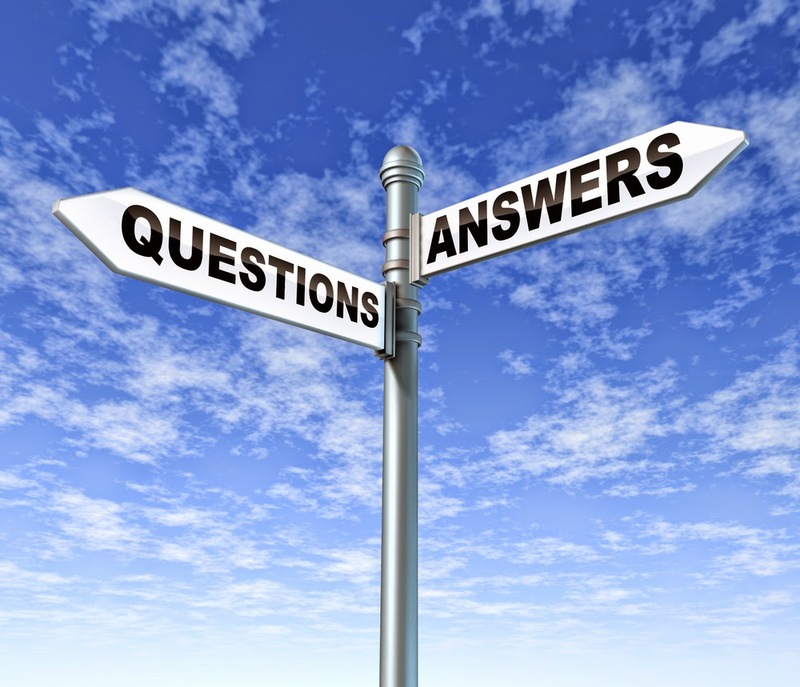 You must ensure every paragraph you write considers the specific question asked. I once marked an F3 script that failed despite virtually every calculation on the mock paper being done correctly. The student knew her theory perfectly, but simply didn't apply those numbers to the company question and didn't analyse what they meant from a business perspective. Knowing theory is just the start. Practical application to the scenario is vital to pass these exam and you must do it regularly in your answers, particularly at the higher levels. It may surprise you to know that people rarely get long calculations questions right. Let's say someone is working out a long NPV at F3 or T4. Only a minority of students will get that final NPV correct. However, it's possible to get the final answer wrong but still get very high marks because marks are awarded for doing each part of the question right. If you can't do one part of a calculation, keep going through to the end doing everything you can and get all the easy marks. You may get the final question numbers wrong, but you'll be scoring method marks all the way through and most likely pass. The biggest issue people have with T4 part B is not the scenario, industry, unseen issues, analysis, recommendations, ethics issues, or writing the report. Their problem is that they don't effectively manage their time, and often fail as a result of not completing the script. Time management is the key skill I teach people at T4 to help them pass. It sounds easy – but it's not. It requires planning, fast working and huge self-discipline. Whatever paper you're sitting in November, managing your time throughout your script will be key to your success. Remember there are 1.8 minutes available per mark. Plan exactly how long you will spend on both the question as a whole and each sub-section, and religiously stick to those timings in the exam. The final key difference I see between people who pass and fail is the amount of work they put in. Those who pass are often more organised with their study time, put in much longer hours, do more practice questions and ask more questions of their tutors. Hard work really does pay off. 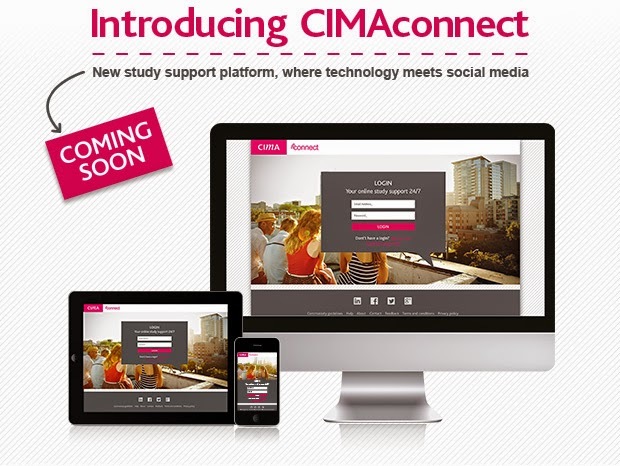 counting down to the launch of CIMAconnect, the new innovative study support platform that combines the latest digital technology in personalisation and social media to provide you with better support with your studies. Personalized homepage - Never miss a thing! Have all your news feed, friends, messages and study resources in one place! 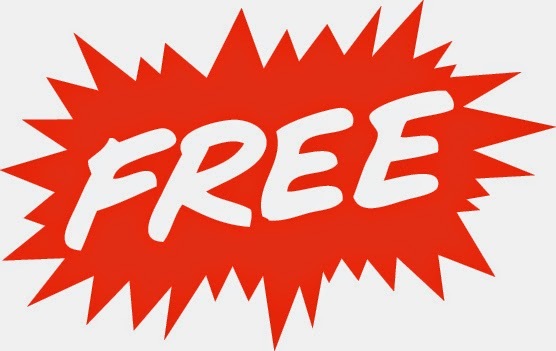 Free, relevant resource - Study guides, reports, videos and more, tailored to your level of study. 'Like' 'Follow' 'Recommend' - Get to know your peers around the world. Share experience and exchange study tips. Get recognized for your achievement - Earn a progression badge as you complete each exam and level. Q : Based on the the preseen and August examination, what do you think are highly likely examinable topics? Q : Information from august's unseen is valid in this November exam? The August unseen helped clarify the structure of EL a bit. That's all. The other parts of August such as the issues it faces did not happen as far as November is concerned.I'm not even convinced that we can rely on EL having a problem with excessive centralization as the August exam implied. Q : What is the best way to prepare for the calculations and what is the best technique/structure in dealing with the ethics section? Q - what's the best approach to passing this paper. I'm finding it very difficult to follow with no real syllabus. Any help greatly appreciated. A : Yes, its like the difference between the part 1 and part 2 of your driving test. All the previous papers have been learn and churn, and now you have to drive the business for T4. The answer is...mock practice and feedback. . There are courses in UK and Ireland for this, as well as online. If you can't manage them then second best is looking at past exams and solutions from the CIMA T4 website. You could try the August exam and then compare your answer with the comments in the PEG on the CIMA website (no solution until after November I'm afraid. Q : Since its the last session of old syllabus, Will exam be easy? A : No - sorry. I don't think that CIMA will change the quailty of its members in order to end the present syllabus on a high note. In fact T4 is one of the assessments that changes the least under the 2015 syllabus. Its becomes the Strategic Integrated Case and it has a different assessment approach but the skills are the same. Q : Please can you share how best we can prioritise the issues in the unseen material when we right the report ? A : Prioritisation is not the big deal that camdidates think it is. In terms of marks...its only a handful of marks. Lots of guys pass with a very different prioritisation from the examiner but...the rules of thumb are...whatever is the subject of (b) will also be one of the two key issues under prioritisation..so put it first. The other is a bit of a wild choice. Usually its something MAJOR (money or organisational/strategic impact) and its usually something the FD has explicitly asked for. But even so I was surprised to read that Decentralisation was one of the key two issues in August. But my key point is...don't get hung up on it. It is not that important in terms of marks. Q : EL organisational structure is based on a global product structure which means their focus on local customer needs can be difficult. However, each of the product divisions are further broken down into geographical regions such as Europe, Asia and North America. My question is with each of the product divisions are broken down into geographical regions, is it a problem for EL Car Company to focus on local customer needs as compared to regional based organisational structure? Q : what recommendations would you give to address the poor leadership issues by Mr Tan the son for example what leadership styles etc as its clear he is not a born leader like his father? Q : I completed F3 in August having completed the other strategy papers earlier in the year. Would you recommend going on a revision class if there is one before the exam next month as I haven't been to any classes for this or do you think looking at as many past papers as possible is ok to understand the structure that the examiners are looking for? Q : Are there any guidlines you can follow when writing the justification section of a recommendation? Q : "CIMA Incidentally the August exam referred to a list of Directors - so now we know who is on the Board" -I was under the impression that the August exam had no relevance to the November exam - is this true? Q : Where is the best place to include industry examples? A: Really anywhere in the report. If its an ethical example, then in the Ethics section. Commerical examples should go in the sections (4 or 6) that are dealing with the EL issue to which you want to relate them. Some candidates get 2 diversity points into the Introduction by saying, for August exam, EL is a global car maker like Toyota and VW (1 mark for name dropping) and then that Toyota/GM/Honda have all suffered recall issues like EL faces with the brakes issue in the unseen. Q : What crucial pieces of corporate governance are missing from EL and how might this be relevant to the exam in November? A : Well...the issue with EL is that its Board seems to comprise totally of the 8 Executive Directors plus the new CEO. No NEDs therefore no independent judgement, checks and balances and so on. There is no Nomination Committee either. Now..we don't know if EL is listed or not. But if a flotation/IPO turns up as an issue in November you would need to make these points and suggest how to resolve them. Otherwise it may be difficult for EL to be admitted to an investment exchange. 1. There aren’t many ‘theory’ calculations in past TOPCIMA papers, that's to mention many of the calculations require a transparent head and customary sense instead of technical knowledge of calculations from previous papers. There’s little point therefore spending lots it slow} reviewing past technical knowledge – it slow is far better spent observing recent CIMA T4 exam questions. 2. The most exception to the current is primarily the NPV calculation which turns up frequently and wishes to be ready to be meted out very quickly. In some cases there could also be three options with an NPV required on each. during this case there's usually only one revenue and single cost line so don’t be postpone, they’re usually straightforward, but you are doing need to work quickly to induce everything done. 3. Other calculations which require some theoretical knowledge have turned up including payback period (discounted and undiscounted), share valuation, return on investment. confirm you've revised these topcis. 4. 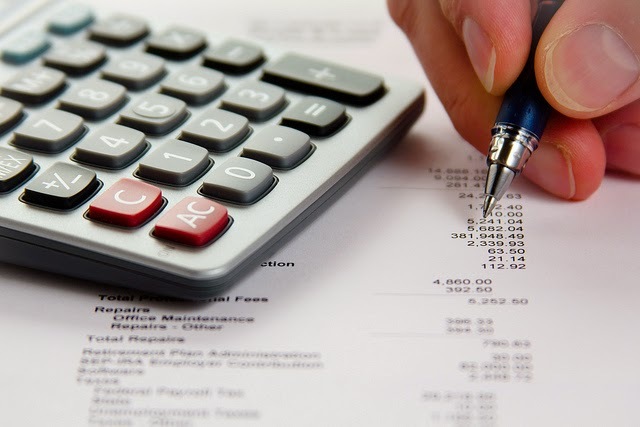 Many calculations are simple calculations of annual profit, comparison with budget or income forecasts. These just require you to stay track of the figures carefully. Be diligent throughout. 5. Probably about 75% of the time, the question is explicit about what's required. Phrases like ‘The Finance Director has asked you to calculate the operating profit for every option’ often come about. Sometimes the calculation required is strongly hinted at with phrases like ‘the target Return on Investment is …’ or ‘The company uses a value of capital of…’. In both these cases it isn’t uncommon to seek out students who have calculated something completely different to it expected, and infrequently something that isn’t helpful to the choice being made. beware and do what the examiner wants, then remember to use that information once you are analysing the data within the body of your report. 6. Occasionally it's simply up to you to choose what calculation, if any, would help the corporate to form a choice. consider carefully about this. it's frequently the case that students calculate say a unit profit when the entire profit is that the deciding factor. Read the question carefully and rely on what's going to best help your analysis. These questions are unlike anything from previous papers so practise of TOPCIMA style questions is essential. 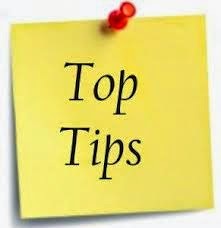 Do as many practise questions as you'll be able to, and make sure you do them below strict regular conditions, so you're practising doing them quickly and then you permit many time for the remainder of the report. Calculations ar vital, but not so important that you simply should spend any further than 20 to 25 minutes on them within the real exam. Introduction - A quick overview of the company is expected in here, but remember you are an internal accountant so don't make it sound like you're an external consultant. It's important not to state obvious things like what the company does. Don't forget to get a good industry example in here for a Diversity mark (I like industry statistics here)"
"The introduction is a necessity as part of your report, but does not earn significant marks, so keep it short and simple." "Interestingly one of the students did not have a formal time plan when going into the exam - I think that's crucial - not just that you have it but also that you have ensured you've done at least 2 practice exams where you keep to your time plan." "Remember your time management in the early stages of the exam - if people are going to mess up their timings, this is the most likely place. Specifically - no more than 15 mins on calcs, just 12-15 mins on prioritisation and manager you time very carefully on the analysis part. Do this and you'll most likely have the right amount of time for the rest of the exam." just as a double check to you all that you are not making the same mistakes: To improve I think: You must do SWOT, Mendelow and SAF; You must include all the issues in your SWOT;You must reference your SWOT and Mendelow comprehensively, ideally twice in the body of the report;You must think carefully about what calculations will add value to the report before starting them so as not to waste time on things that aren't helpful; You must do a reasonably accurate job on the calculations in some way this is the hardest because a small mistake can have huge consequences here. There are easy marks in these sections - make sure you get them...."
"When does an ethical issue become a business issue prioritised in the top 4? When the 'business' impact is higher than other issues in the unseen. Your default position should be to just include it in ethics unless it is so serious (often due to serious reputational impacts) that you think it needs to be a main issue too." it is necessary to incorporate all of the new information given in the unseen material in the SWOT in order to earn high marks. You are also reminded that all of the issues prioritised should be included in the relevant section of the SWOT." The SWOT is easy marks - make sure you do it and do it well...."
Don't forget the good things you did on earlier mocks. I'm getting a number of scripts where people, in an attempt to correct earlier problems, are then forgetting the good structuring and style of earlier mocks. I'd suggest everyone who has past mocks to refer to, takes a look back at the things you did well in those to ensure you continue to do that in the real exam."
. Remember all the great exam technique you had for previous calculation exams. I've seen a few scripts recently where people just forget to show workings, or produce something which is unintelligible to a reader, with all the detail the reader would like to see hidden in the cells." A really good tip for the ethics section recommendations is to give two sub recommendations for each ethics issue - firstly the recommendation that sorts out the issue in the question, and then a longer term solution that stops this issue arising again in the future (e.g. 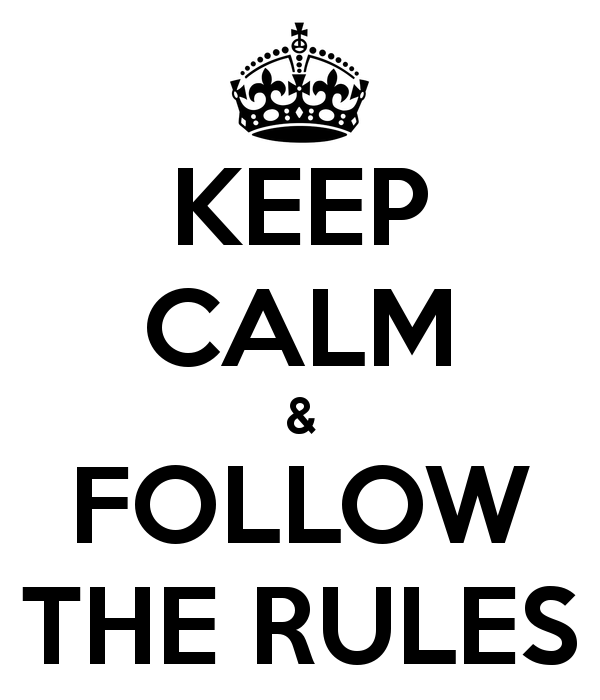 ethics code, or ethics training or more controls)"
"Part b - Remember to keep your points made to short 2 line points - that's about a line of making your point, and another line of giving the meaning of that point. Take a look at the examiners part b overview to see the style that they're looking for." Part b - Still getting lots of people just writing 3-4 word bullet points without explaining what that point means. Remember - aim for 2 lines with a good explanation. I keep on having to repeat this point - surely it's not that hard to do!!!" Make the best use of the preseen in your exam, by making sure you have a full, focused analysis of the case, from one of the world’s most experienced CIMA Tutors.